Who will benefit from the UK’s ‘golden partnership’ with China? 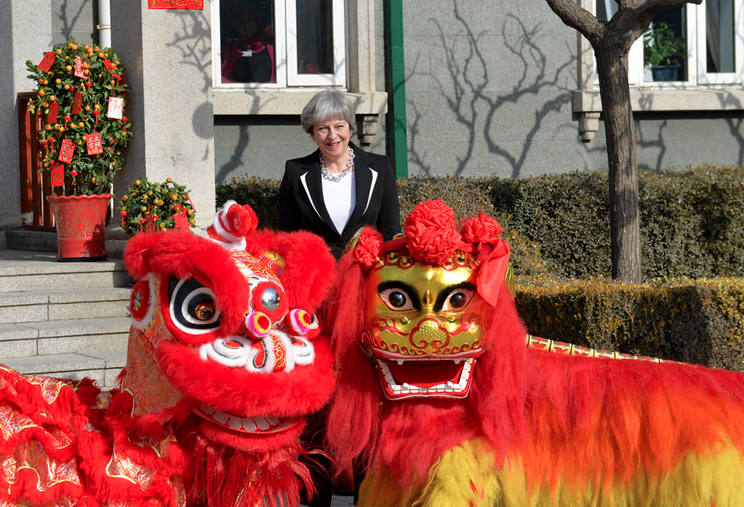 By GlobalJustice: Prime Minister Theresa May is currently visiting China to strengthen the UK’s relations with Beijing. In a press conference at the Great Hall of the People, she reiterated the UK’s commitment to intensify the “golden partnership” with China and said the UK was “a natural partner” for China’s ambitious Belt and Road initiative. China is now a major trade power, increasingly viewed by major economies as the new champion of globalisation, now that the US is following a more protectionist route through Trump’s “America First” policy. As a result, the UK is positioning itself as China’s close economic partner. But who will this partnership benefit? China-UK trade is now at an all-time high. Although the UK is not one of China’s top three investment destinations globally, it is now the biggest recipient of Chinese investments in Europe, followed by Germany and France. Since the influx of Chinese capital to Europe, the sectors that attracted them the most are energy, automotive, food and property. Chinese investors have poured £29 billion into a broad range of assets in the UK ranging from prime London property to banks, energy projects and football clubs since 2005. Property here is particularly attractive due to a predictable, transparent and rules-based legal system. Chinese investors have pumped more than £8 billion into UK properties, nearly a third of China’s overall investment in Britain. In 2017, foreign direct investment (FDI) into the UK from China reached £15 billion, up from £6.5 billion in 2016. Li Keqiang, China’s Premier, said in the meeting with May that China invested more in the UK last year than almost any other country. Chinese firms have increasingly invested in services, advanced manufacturing, technology and other high value-added and consumption-related sectors, as well as in assets providing high and stable returns. With the 2016 implementation of the ‘Made in China 2025’ initiative – a part of China’s current Five Year Development Plan seeking to propel it into a high productivity economy – more Chinese overseas investment can be expected in the sectors considered high priority by the Chinese government. Chinese investors like the UK so much because there is money to be made here. In the last meeting of the World Trade Organisation in Argentina in December, China announced that it will invest $2 trillion abroad in the next 15 years. The Belt and Road initiative is China’s foreign, economic, trade, security and development policy rolled into one. As a political strategy it aims to achieve parity with the United States in Asia and Europe. It ensures the security environment and political clout it needs for its continued rise as a superpower, which in itself is not bad as new actors can introduce new dynamics into international political economy. The new infrastructure being built under Belt and Road, which is connecting countries from Spain to Indonesia, has geopolitical importance and creates leverage for China to avoid encirclement of US allies around its borders and other strategic areas. In January 2016, China became a member of the European Bank for Reconstruction and Development (EBRD). This membership facilitates EBRD’s investments in Belt and Road projects in member countries, particularly the construction of transport links between Asia and Europe. The increase of Chinese investments in Europe (in the EU, Switzerland and Scandinavian countries) and other advanced economies follows the logic of its new realities and aspirations. It is transitioning to a new economic model of producing more high-end technology and expensive products and away from the cheap and low quality manufacturing that it is notorious for. The 2008 debt crisis was a pivotal moment as it enabled the Chinese government to purchase Eurobonds and invest in infrastructure companies at extremely competitive valuations. Chinese investors took advantage of the European Commission’s pressure on crisis-affected countries in Southern Europe to privatise state companies and the firesale of public assets that ensued. Almost everyone is trying to get on board with China’s Belt and Road initiative. However, for us in the UK it is important to ask if the post-Brexit partnership with China and the growing Chinese investments in the UK will be good for marginalised people here. If Theresa May’s vision of the ‘British dream’, or ensuring that ”each generation has a better future than the last”, is to prove more than hollow rhetoric, it should lead to concrete and justice-based strategies that address the increasing poverty and inequality in the UK produced by austerity measures, diminishing wages and the increasing cost of living. So far there are few signs that this is anything like the approach. The UK’s dedication to neoliberal policies has promoted the unfettered power of transnational companies over the past four decades. It is interesting that China is carving out a role in the global political economy and has now evolved into a global engine promoting a neoliberal agenda: from free trade agreements to corporate-led integration across borders. Will the contradictions inside the UK and Chinese economies be resolved by a ’golden partnership‘ that will push more of the same policies and measures? Although China is now seen by some as a beacon of hope that will save global capitalism, we need to remember that the dominant mode of wealth production and economic relations has also brought about runaway climate change and inequality, which are major challenges that China is also grappling with. Challenging the power of transnational corporations (whether Chinese or not) that are taking away our rights and lowering our living standards must not take the form of populist measures and anti-Chinese backlashes that raise fear and hatred. We do need to raise our concerns, however, when officials do their grand tour abroad to woo investments and trade deals. Trade deals and partnerships are not just about increasing markets, they are more and more about the increasing power of corporations in general, which increases the asymmetry of power between governments, corporations and people. Ordinary people will only benefit from these kinds of partnerships if we refuse to let corporations come first.